Back up cameras can help prevent backing into people in town or into tree stumps while off road. Forward facing cameras with a digital video recorder (DVR) can help avoid lengthy or fraudulent accident disputes. All those online videos of mayhem on foreign highways came from forward facing cameras. An automotive camera system is about as easy to install as a typical car stereo system. Having a color monitor built into the rear view mirror is a fun way to customize an older vehicle. Significant modifications are usually not required. 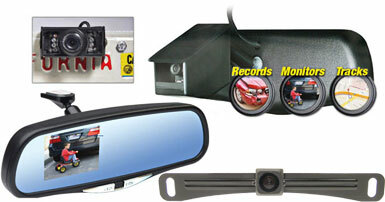 Reinstall the old rear view mirror and move the camera system to your next car if you like. RockAuto.com has back up and combination back up/forward facing camera systems for cars and trucks. To see camera systems and learn how they are installed, go to RockAuto.com and find camera systems in "Accessories" under the "Tools & Universal Parts" tab or simply click here.